English: Good Bye, Dragon Life. 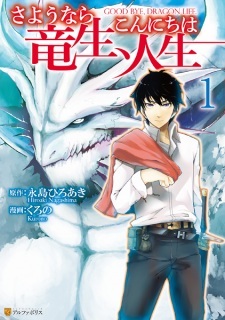 An isekai manga set in a fantasy-medieval time period about an old dragon who is reborn as a human in his next life. Despite the positive attention that this manga series has received, I feel like the plot suffers from pacing issues and uninspired dialogue. This of course affects the development - or lack thereof - of the characters as well, which remain stereotypical and shallow at this point in the manga, in my opinion. Other than the slightly better than average art style for this genre, I don't think this manga has been executed well thus far and brings nothing new to the table.